The sponsors of the bills say poisoned drinking water is widespread in the state. AUGUSTA — Contaminated drinking water in Maine is widespread and many people may not even know their wells are poisoned, according to state lawmakers pushing to increase funds for awareness and testing. The Legislature is considering a series of bills aimed at making sure Mainers, especially children, are not drinking water contaminated with lead and arsenic. Rep. Karen Vachon, R-Scarborough, told lawmakers Friday that 38 percent of the wells in her hometown are contaminated and only about half of all the wells in Maine have been tested, while about half of the state’s population gets its drinking water from private wells. Vachon said the problem wasn’t limited to one part of the state or another, noting that one in six wells in Maine has arsenic levels that are far beyond the levels recommended by the federal government. According to maps distributed by Vachon on Friday, there’s so little testing in parts of the state that the data are insufficient to calculate how many homes may be at risk. Other areas of the state where there are known issues have better and more comprehensive data, the maps show. Vachon is the sponsor of L.D. 454, which would increase by $10 the fee charged by the state’s water testing lab to create an account to help the Maine Center for Disease Control and Prevention increase its education efforts. Vachon said her bill was virtually identical to one that was vetoed by Republican Gov. Paul LePage in 2015. The Legislature fell two votes short of overturning the veto. Vachon’s bill would initially raise about $70,000 for the Maine CDC, but it also would set up an account that could accept grants and other sources of funding to expand education efforts around well water testing. In his veto message two years ago, LePage wrote the measure was unnecessary because private well testing was on the increase already and the Maine CDC was already engaged in updating educational materials for well water testing. “Testing of private wells for arsenic already has increased from about 26.5 percent of wells in 2003 to 45 percent of wells in 2012,” LePage wrote. But Vachon said that means more than half of the private wells in Maine are going untested. Carlson detailed the impacts of arsenic poisoning in her testimony, noting it was a known carcinogen linked to bladder, lung and skin cancers. She said it is also a likely contributor to prostate, kidney and liver cancers as well. She said that based on the most recent five-year data from the U.S. National Cancer Institute, Maine’s bladder cancer rate per capita was the second highest in the nation. She also pointed to other studies that show arsenic is a factor in cardiovascular and respiratory diseases, high blood pressure, diabetes, infertility and causes neurological damage leading to reduced IQ points for children. Also before the committee Friday were bills that seek to protect children from lead and arsenic poisoning and those that would test public buildings, including schools, in Maine to ensure they, too, have safe drinking water. Those measures – offered by Reps. Jared Golden, D-Lewiston, and Heidi Brooks, D-Lewiston – would waive any fees for home lead dusting tests, require public schools to test their water supplies for lead and other toxins, and expand that testing to all other public buildings that use a water supply that is not a public water system regularly tested for contamination. Brooks’ bill on schools would also require the state to make public the school test results. The Maine CDC’s chief operating officer, Sheryl Peavey, testified against the bills by Brooks and Golden. Peavey said the Maine CDC agreed with the intent of the bills but said they amounted to unfunded mandates on local municipalities and schools. “We agree that schools should take all appropriate action to ensure their water is safe, but if the state is not going to fund a mandate, it should not levy that mandate,” Peavey said. Peavey said the lead dust testing bill was unclear and the terms “free home lead test kits” and “provide” were not well defined. 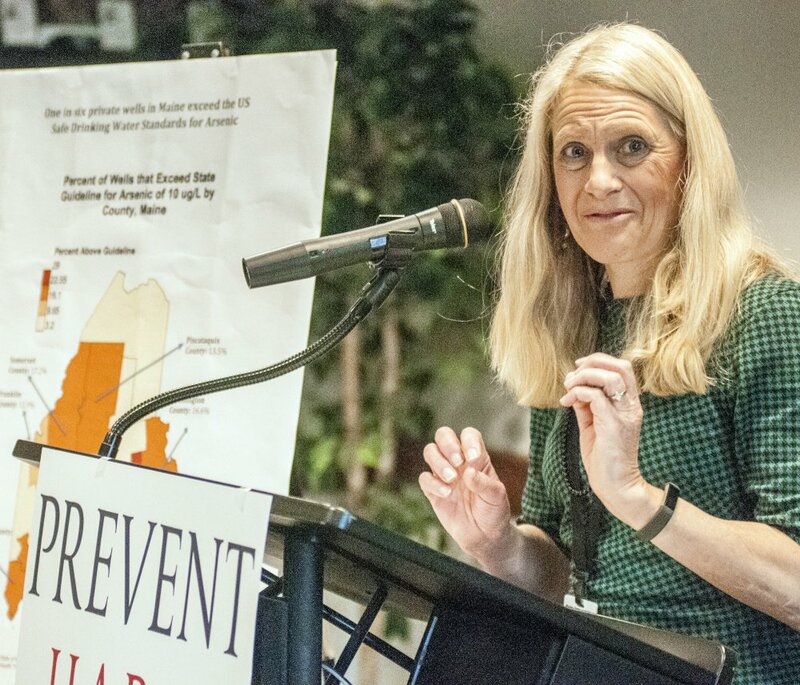 She also said the measure did not take into account activities already being implemented by the Maine CDC, including a yearlong statewide pilot on lead testing that is underway. Some in the private water testing lab sector in Maine said they were neither for nor against the bills but pointed out some of the language in the legislation all but ensured a state-run monopoly on water testing in Maine. Rebecca Labranche, laboratory director for the Auburn-based A&L Laboratory, said her company supported mandated testing for schools to protect the health of children. But she said many schools already do test and are clients of private labs. The state’s CDC water testing lab is already the largest competitor to the private labs in Maine, Labranche said. But advocates for the bills said high naturally occurring levels of arsenic in Maine water were not well known and the state needed to do more to help people learn about the hazards of contaminated water and discover if their water was safe to drink. The bills will be back before the committee for a work session in the days ahead before going to the full Legislature for consideration.